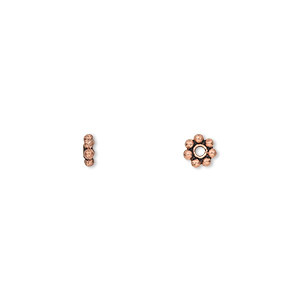 Bead, antiqued copper-plated copper, 10x7mm double-sided beaded oval. Sold per pkg of 30. Electro-coating preserves the life of the plating for long-wearing shine and lasting glow. Handcrafted so size and shape may vary slightly. Bead, antique copper-plated copper, 7x4mm rondelle, 3.5mm hole. Sold per pkg of 30. 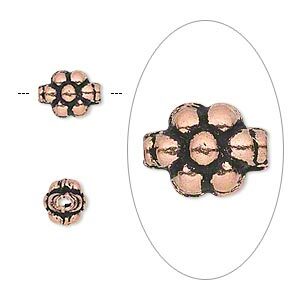 Bead, antique copper-plated copper, 7x3mm beaded rondelle with 2.1-2.2mm hole. Sold per pkg of 30. Bead, antique copper-plated copper, 6x4mm rondelle with rope pattern. Sold per pkg of 40. Bead, antique copper-plated copper, 4x1mm beaded rondelle with 0.9mm hole. Sold per pkg of 50. 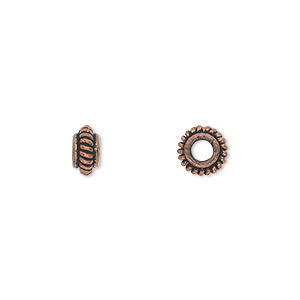 Bead, antique copper-plated copper, 6x4mm rope rondelle. Sold per pkg of 40. 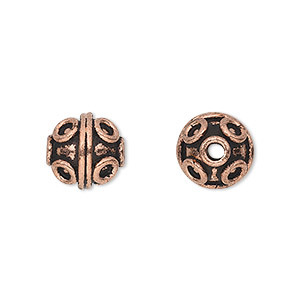 Bead, antique copper-plated copper, 10mm round with circle and line pattern. Sold per pkg of 8. 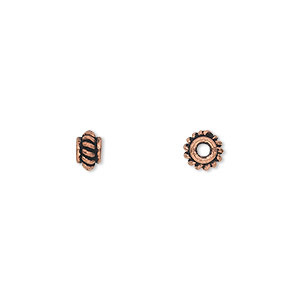 Bead, antique copper-plated copper, 5x2mm beaded rondelle. Sold per pkg of 50. Bead, antique copper-plated copper, 11x10mm rondelle with beaded and rope pattern. Sold per pkg of 8. 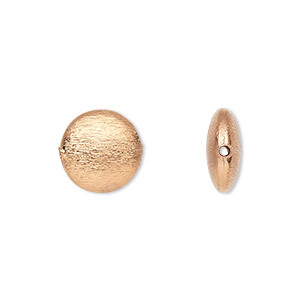 Bead, copper-plated copper, 12mm brushed puffed flat round with 0.9mm hole. Sold per pkg of 6.